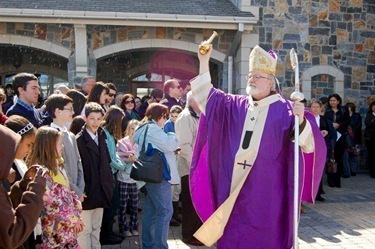 As you read in my post last week, we launched the Theological Institute for the New Evangelization, which will be based at St. John’s Seminary. We’re all very enthused about the launching of TINE. 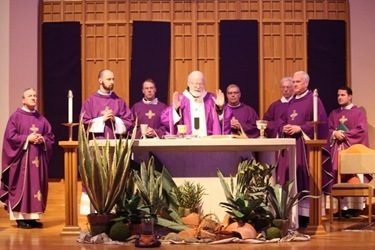 It will encompass all the seminary’s formation program for non-seminarians that train the laity, deacons and professed members of religious communities for pastoral ministry. 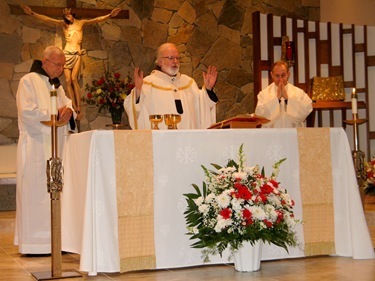 It’s obvious that we need to be able to train our deacons, laity and religious in the methodology, theology and spirituality of the New Evangelization to prepare more pastoral workers, catechists and lay ministers for the archdiocese. This is a very important initiative and I was so pleased Scot Landry invited Drs. 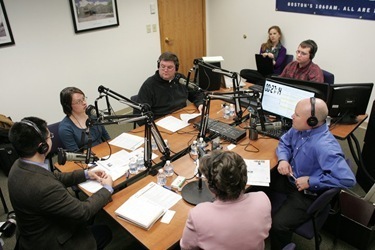 David and Angela Franks and Aldona Lingertat to his radio program, The Good Catholic Life, to discuss this last Thursday. 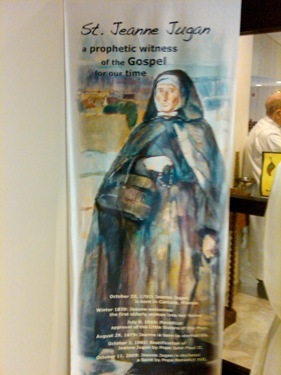 It certainly shows the synergy that can exist between the new initiatives of the archdiocese. The radio station is a great blessing for us, and allows us to reach a large audience with our message and keep people updated about our initiatives. 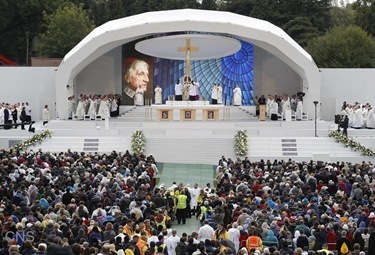 Last September Pope Benedict made a pastoral visit to England and there was a great concern about how the Holy Father would be received. All of us were overjoyed to see the outpouring of faith and devotion of the Scottish and British Catholics. 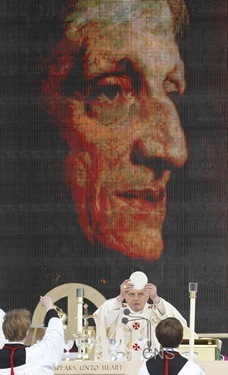 The centerpiece of his visit, of course, was the beatification of Cardinal John Henry Newman, who is such an important figure in the history of the Church. Indeed, the Holy Father has a particular interest in Newman as a theologian and an intellect. In this pontificate, the practice has been that cardinals or the Prefect of the Congregation of the Saints conduct beatifications, but it is significant that Pope Benedict chose to celebrate this one himself. 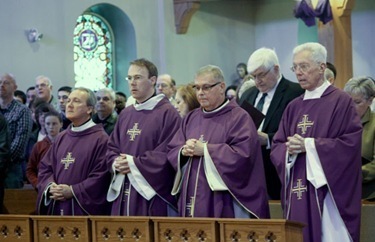 It was unfortunate that I was not able to be there, due to many things going on here in Boston, but I was delighted that we were represented by Bishops Boles and Irwin, and a number of other people from the archdiocese. We were very honored that our own deacon, Deacon Jack Sullivan, read the Gospel at the Mass and his wife, Carol, presented the Holy Father with the offertory gifts. 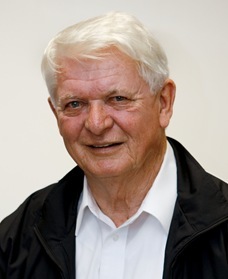 Jack, as you might know, experienced the miracle that allowed the beatification process to go forward. 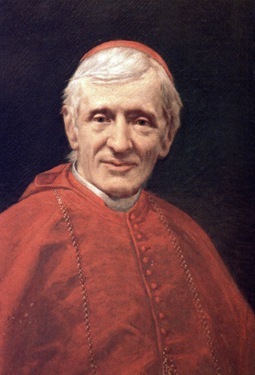 He suffered from a debilitating back condition but through prayers and the intercession of Cardinal Newman, he was cured. 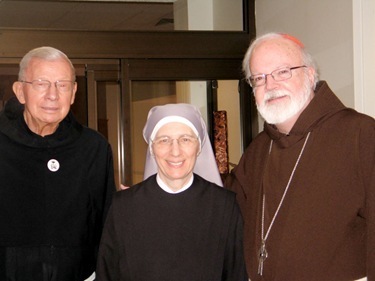 Last Thursday, Jack and Carol visited me and we had a wonderful conversation about the beatification and his ministry. In fact, Carol is the niece of Bishop Bob Mulvey, who is an extraordinary bishop, now retired, whose friendship and ministry we all cherish. 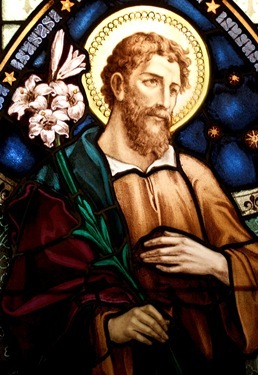 March 19, the feast day of St. Joseph the patron of the Universal Church, is a grand event in the calendar of the Church because we celebrate and honor the man who was entrusted with the care of the Blessed Virgin and the Christ Child. Although we don’t have a great deal of information about his life, we know that he is one of the greatest examples of sanctity and fidelity to God’s word. 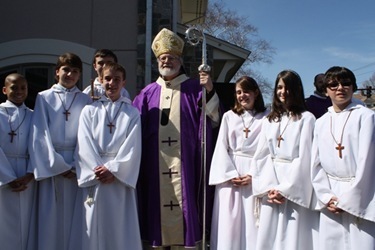 We have an order of sisters here in the archdiocese whose patron is St. Joseph, the Sisters of St. Joseph, and many religious orders have a very particular devotion to Joseph. The Capuchins, for example, have always been particularly devoted to him because of the aspects of manual work in their community life. The friars saw a great model in Joseph and his intimate relationship with Christ and the Blessed Mother at Nazareth — the spirituality of the hidden life is a very important part of the Gospel message. 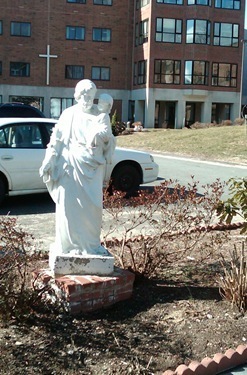 Among the communities who have a particular devotion to St. Joseph are the Little Sisters of the Poor, who depend on providence for the maintenance of the ministries to the elderly and the poor. 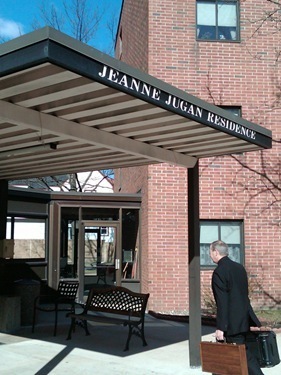 I was delighted to be able to celebrate Mass at their Jeanne Jugan Residence in Somerville on their feast day and have lunch with the sisters. It was very encouraging to hear the sisters have nine novices this year. A number of those young women came out of the FOCUS groups that are now working in the archdiocese. I think that is one more indication of how the New Evangelization reaps many benefits in the life of the Church. 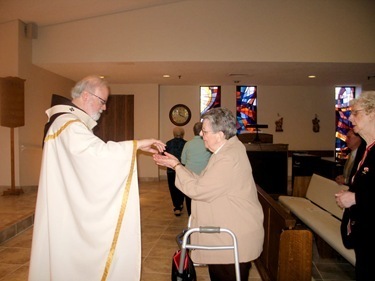 The Church’s ministry to the elderly and the infirm is a great witness to the Gospel of Life and the importance of human life in all its phases, even when it is most vulnerable. This is such an important ministry in today’s world where many would promote euthanasia as a solution to the challenges for old age and infirmity. In the Church, however, we show loving attention to our elderly as a sign of our own interdependence. When we are healthy and well, we take care of others; and when we are children and old, other people take care of us. This is what our life is about, communio within the Church. 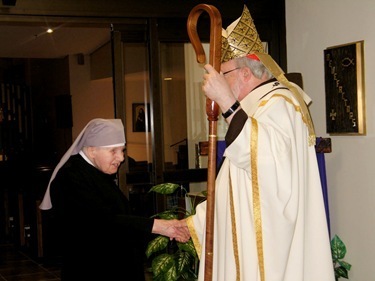 We are blessed to have orders such as the Little Sisters of the Poor, the Carmelites of the Aged and Infirm, the Daughters of Mary and the Grey Nuns ministering to the elderly and poor in our area through their nursing homes. 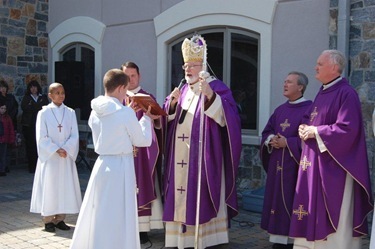 On Sunday I was pleased to be able to bless the new parish center at St. Raphael’s Parish in Medford. 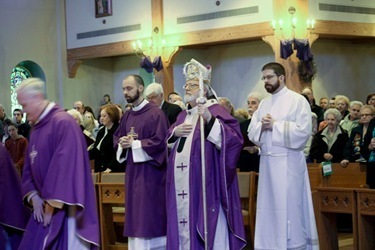 St. Raphael’s is a very involved parish. 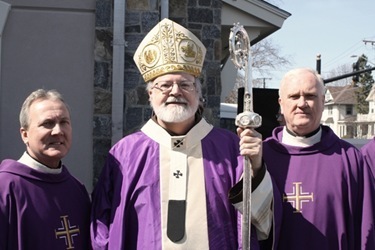 Fathers Kevin Toomey and Bob Cullen, with the help of their deacon and lay leadership, are doing a terrific job. The school is also flourishing. 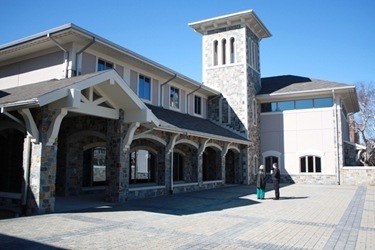 A few years ago the church burned down and the people there built a beautiful new one. 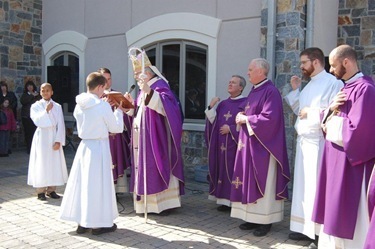 Their latest accomplishment in the parish has been this extraordinary and stunning parish center that has all kinds of room for the youth, the elderly and for meetings, and even a beautiful patio in front of it. 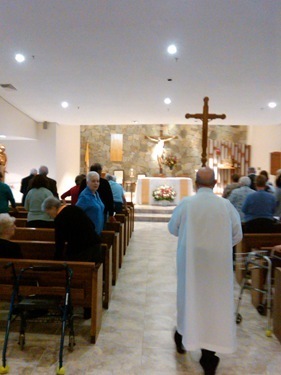 It’s really a very uplifting experience to be at St. Raphael’s. 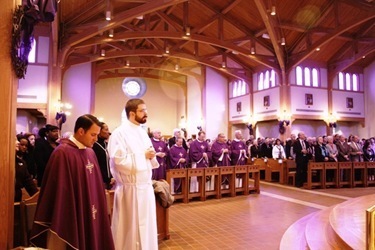 It was a delight to be able to dedicate the new hall. Until next week, peace be with you!